"Ethereal. Magical. Feminine." 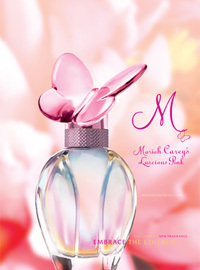 Introduced by Elizabeth Arden in June 2008, Luscious Pink is the second celebrity perfume by Mariah Carey. This sparkling floral fragrance is a luscious harmony of peony, bellini, tiare, and blond woods giving Mariah's celebrity fragrance a sensually feminine and playful aroma.